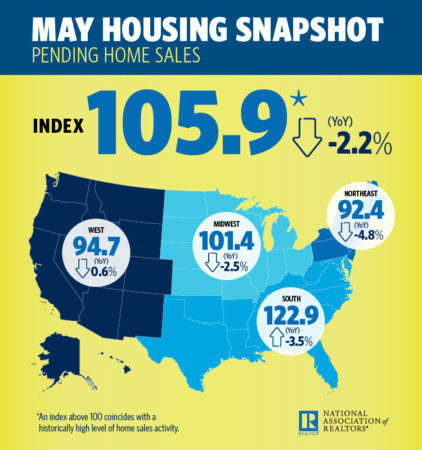 Pending home sales dropped 0.5 percent month-over-month and remain down on an annualized basis for the fifth straight month, according to the latest National Association of Realtors (NAR) Pending Home Sales Index (PHSI), released on Wednesday. PHSI tracks home sales in which a contract is signed but the sale has not yet closed. Yun said the “lackluster spring,” has mostly been because of the low inventory issues that continue to plague the real estate market. Inventory declined on an annual bases for the 36th consecutive month and listings typically went under contract in just over three weeks. A larger decline in the south – where pending home sales fell 3.5 percent – offset modest gains in the northeast, midwest and west, which saw gains of 2.0 percent, 2.9 percent and 0.6 percent month-over-month, respectively.